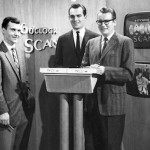 When SCAN first started Larry McIntyre, Don MacDonald and I were known as the Scan Clan. The origin of the name escapes me now but I do recall we kicked around a variety of names for that 6PM newscast before coming up with Scan. We wanted something short and catchy. At one time, the 3 of us sort of rotated, each of us spent one week out of three working the late afternoon and night run doing the late news. 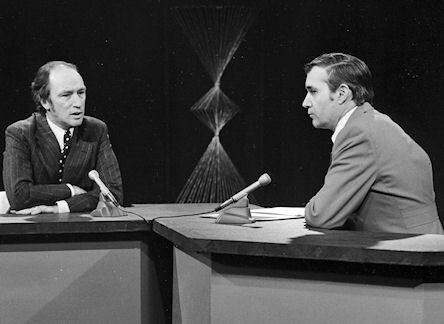 The other two worked the days, writing, reporting and performing on the 6PM show, which contained a local and area newscast, plus another national / international segment, and a sportscast, and weathercast. There was also an interview segment in the program during which we brought in civic officials, service club members, local and area politicians etc. Somewhere in those years we brought in outside people to do our weather reports. Dave MacDonald and Jim Miller, both of whom were employed by the federal government Meteorological service at the Waterloo-Wellington Airport weather office. They alternated doing the 6 pm weather depending on which shift, early day or late day they were scheduled for at the Airport. The 6 pm SCAN news program was very successful, so much so that people in the community took to referring to that news program as – “SCAN’. SCAN… where did the name come from? 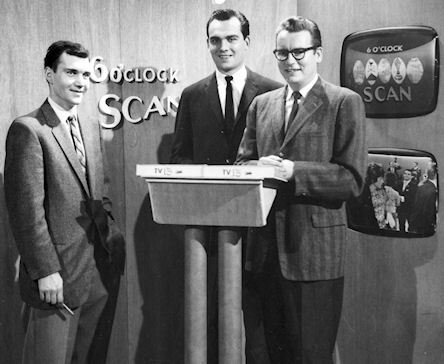 When CKCO decided to create the hour-long six o’clock package, Scan was the one suggestion among many that continued to be put forward, and with the launch date imminent it was finally adopted. As a masthead it already had currency in the News Department. In the early 60s the News Department had published a daily one sheet headline newspage under the masthead ‘Scan’ – the morning newsman wrote the content, cut the stencil, inked the rollers and ran off Gestetner copies, then delivered them not quite dry to downtown Twin City restaurants for mid-morning coffee drinkers to ‘scan’ as a local station promotion. The initial opening title and closing credits to the show were an oscilloscope scan of the audio tracked theme that Pat Ludwig and I had worked out on the studio Hammond, shot SOF (Sound On Film) by Doug Lehman, with the word ‘Scan’ flipping superimposed onto the screen over a live studio shot. 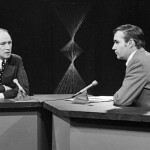 Scan was a major innovation in CKCO programming: an hour-long supper hour news program that pushed news viewership back from 6:30 to 6:00 o`clock, expanding on the previous 6:30 half-hour, initially straining the resources but driving the expansion of CKCO`s News programming, bumping out the 5 – 6:30 supper hour movie that had been the previous programming staple, going head to head with CFPL London`s longer-established “Panorama” for early evening audiences in Southern Ontario. As Gary McLaren has remarked, the word came to identify the six o’clock CKCO news package, referenced still by long-time CKCO viewers.